Weaver - Mentor - Centaur - Stuck - Stringed Instruments - Healing Humor - Shame - Left and Right Brain - Abandonment - Evolution: just a few of the keywords Joyce Mason uses to unlock the doorway to deep, deep wisdom contained within the archetype of the mythical being known as Chiron: half man, half horse – best known in Western popular culture as the Wounded healer. 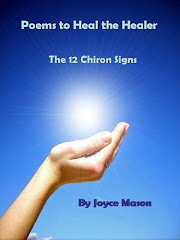 As the reader will discover from Other Astrology Books by Joyce Mason on pp 279-281, Joyce has written extensively on Chiron in the past, both in published books and on her blog The Radical Virgo. This book, however, is somewhat different in that Joyce’s focus is on the Chiron archetype itself and an exploration of 50 branches arising therefrom. Chiron symbolises the deep wound present to a greater or lesser degree in all of us, fallible imperfect creatures, uneasy blends of body and spirit; endlessly curious, forever seeking answers to why we are here and what we are supposed to do with our brief time on Earth. Chiron also symbolises the depth and wisdom we can gain by addressing and seeking to heal that wound, both in ourselves and others. Ultimately, facing and accepting our vulnerability, together with realization of our inter-connectedness with the whole of life, and the healing power of love: these are our salves and our saviours. 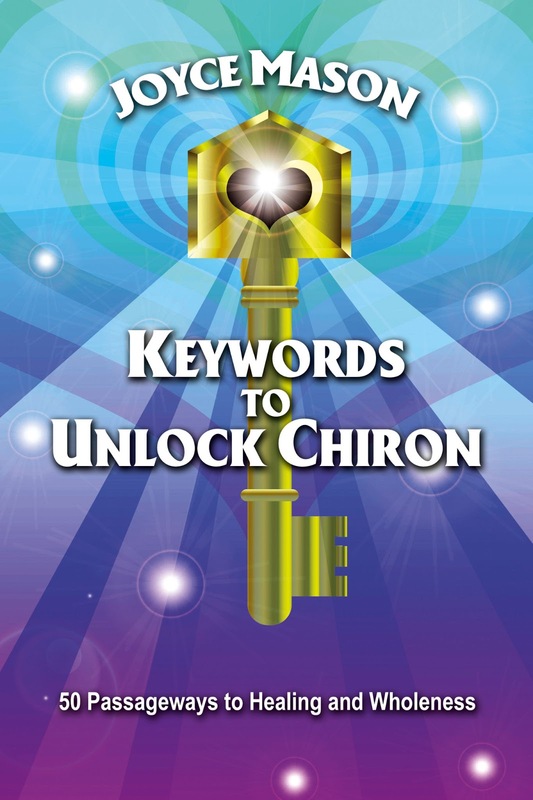 Joyce’s Keywords to Unlock Chiron is surely a ‘wisdom book’. It is a wonderful distillation of her knowledge, personal and professional experience drawn from a deep and wide range of sources: science, myth, symbol systems including astrology and Tarot, astronomy, and culture both contemporary and ancient. She writes so well, with wit, reverence, irreverence and above all compassion both for her own frailty and ours. Open sharing of core aspects of her personal story demonstrates that she is not trying to tell us how we should live from her somewhat higher plane of existence. She makes it clear that, in the struggle to come to terms with the wounding which hopefully in the end makes us a bit wiser and more skilled in the fraught business of living, we are all in it together. There are many examples which I could quote of deeply helpful wisdom offered in this book. In Chapter 24, Disowned, there is a very challenging question posed: ‘What would you rather die than do?’ Joyce’s answer to this is ‘I’d rather die than move (house)’ which leads into a discussion of how we all to a greater or lesser extent, disown parts of ourselves, to our detriment. 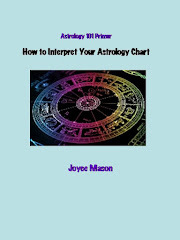 In Appendix 3, p273, Joyce provides information for people with little or no knowledge of astrology who wish to obtain a copy of their own horoscope and find out where Chiron is placed in their case. 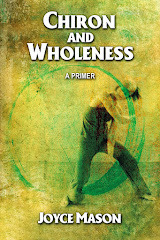 The whole book is also filled with useful web and other references to a wonderful range of resources – arising from the core Chironic keyword of Wholeness. The book is of value also to students and practitioners of astrology. From that perspective, this reviewer certainly felt as though she had been comprehensively re-acquainted with the depth and practical value of understanding Chiron’s natal position as well as Chiron transits. Joyce, thank you for this wonderful compendium. It truly deserves to be widely read. Cover Art for Keywords by Karen Phillips. 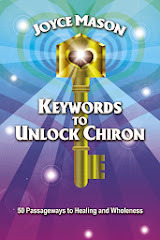 For more on the contents of Keywords to Unlock Chiron, now available in PDF, please visit the launch post. 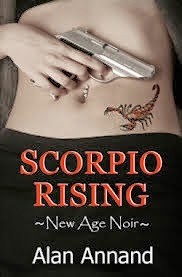 My intrigue and delight intensified as I read Scorpio Rising. Not only is it a page-turner; it’s full of information about astrology, palmistry, Ayurveda and other assorted esoteric arts. These ingredients become a powerful potion when stirred with the pointed intuition of protagonist Axel Crowe. He has access to clues as a symbol-wielding private eye way beyond law enforcement’s linked databases. Axel is uncanny, a Sherlock Holmes without the attitude. He’s a near-saintly character whose walk on the straight and narrow has been influenced by his guru of many years who has recently set him free to fly solo. Before we think Axel’s too virtuous, we find he’s got an only- too-human bent for playing the ponies, a vulnerability that makes him believable any time he veers too close to the edge of almost too good to be true. And in the clinch, he will fight crime in a more literal sense. There are two things I enjoyed most about the book. First, there are three places and subplots that are alternated throughout the chapters. Initially, I thought this would be confusing, but instead, Alan Annand braids them into one intriguing, tension-increasing story line. As the suspense mounted, I kept sensing and even getting inklings about how the three scenarios would all come together, yet I was still pleasantly surprised with the denouement. Second, Annand’s sense of humor, especially in naming his characters and in the occasional wordplay thrown over Axel’s shoulder, kept me smiling and enjoying, page after page. This intelligent, versatile author’s eclectic experience on numerous subjects is presented in the most casual and effective way. I felt like saying, “I knew that!” even when I did only because the author gave me a course in a nutshell in a few preceding sentences. I can barely wait to read #2, the next installment in the Axel Crowe series, called Felonious Monk. Axel Crowe has won a place in my detective hall of fame on the first try. Author Alan Annand is one of my favorite new finds. Highly recommended! For more fiction and humor by Alan Annand, visit his website, sextile.com. It's just around the corner! The Cardinal Grand Cross reaches its peak on April 22-23. Astrologer Anne Beversdorf, trained in both Western and Vedic astrology, has a metaphor about the Grand Cross and how we can expect to experience it in her latest newsletter that's the best I've heard yet. It's free to subscribe to Anne's Stariel Astrology Newsletter, and since this is just one of her brilliant observations and interpretations, I encourage you to consider it. 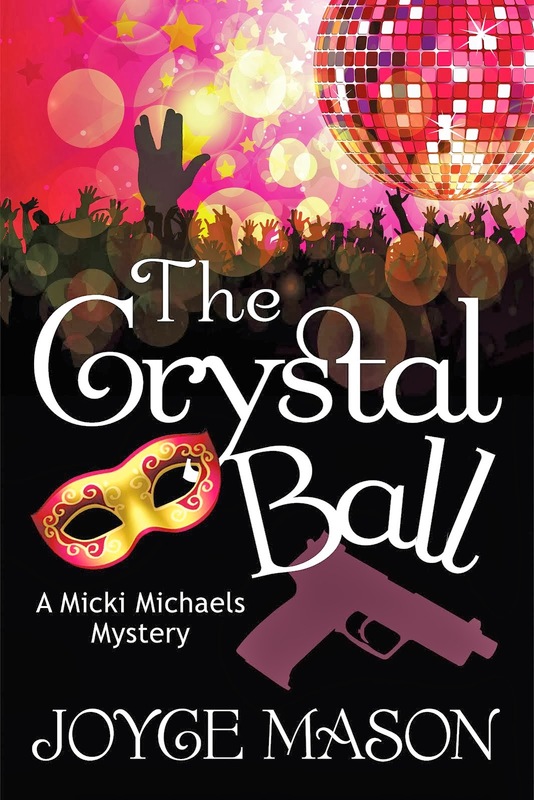 I had never encountered anything like it when I first began writing my novel, The Crystal Ball, in 1989. I was still learning a lot about writing, and my book and I suffered from genre confusion. I didn’t know if The Crystal Ball (then called something else) was a romance, a mystery or some kind of yet-to-be-defined metaphysical and literary variety show. Looking back on the original manuscript, it was a cross between a Janet Evanovich/Stephanie Plum novel and a Harry Potter book for grown-ups—grown-ups who wished they could live forever in a Fantasyland called San Francisco. Mostly, it still is, throw in a lot of basic 101 presentations on metaphysical topics. I should add; it’s way more grounded than it might first sound. In the intervening years, however, composite genre novels that feature astrology and other metaphysical tools have started to crop up more often. When I began The Crystal Ball, I had just fallen in love with Chiron, a composite planetary object, part asteroid and part comet. Chiron taught me the value of hybrids. Composites often beat putting things into tidy boxes, a principle that applies to book categories, too. Now that brick-and-mortar bookstores are dwindling in favor of virtual shopping experiences, a book’s single genre label is less important. In a store with shelves, it’s important to know which shelf to put it on. (Mystery? Romance? New Age?) In the virtual environment where key words are the stuff of searches, the more words or genres that describe a book, the more it will be found by diverse readers interested in its multi-topics or themes. After feeling like the Lone Ranger and ahead of my time, wondering if I could really sell an astrologer protagonist: The next time I heard about an astrology-themed novel was when Donna Cunningham was writing her eBook published in 2004, Hotline to Heaven followed by Angel in Peril. (More on this pair below.) Donna has been a friend and mentor for over 30 years, so I had the fun of hearing about these works in progress. Of course, I loved her idea. Meeting author Sunny Frazier circa 2005 at one of my local Sisters in Crime writers’ meetings introduced me to my next astrological mystery, her first novel in the Christy Bristol series, Fools Rush In. Come to think of it, I just got the pun about how Sunny’s and Donna’s titles combined described my feelings in the late ‘80s—like a fool rushing into where angels dared not tread, thinking I could come out of the closet about astrology in a novel anyone, “New Age” or not, could read. Back then, I still often encountered conservative people who thought my belief in astrology was insane or as one man bluntly put it, “out of touch with reality.” No wonder it took me two-and-a-half decades to work up the courage to make the leap. Thanks heavens we’ve come such a long way in the quarter century since then. More recently, astrologer Armand Diaz coined a new term for mysteries that feature astrologers. In his article The Astrologer Did It: A New Kind of Mystery, he calls this emerging genre Astro-detective fiction. In addition to The Crystal Ball, he mentions Scorpio Rising by Alan Annand and Stalking Anubis by Steven Forrest. Being part of a new trend that “Chironizes” books by creating fascinating hybrids would, of course, turn me on. 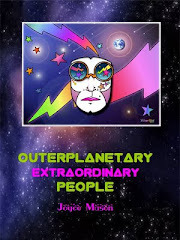 Thanks to a number of synchronicities, I also heard about an increasing number of other Astro-detective and Astro-metaphysical type novels recently. 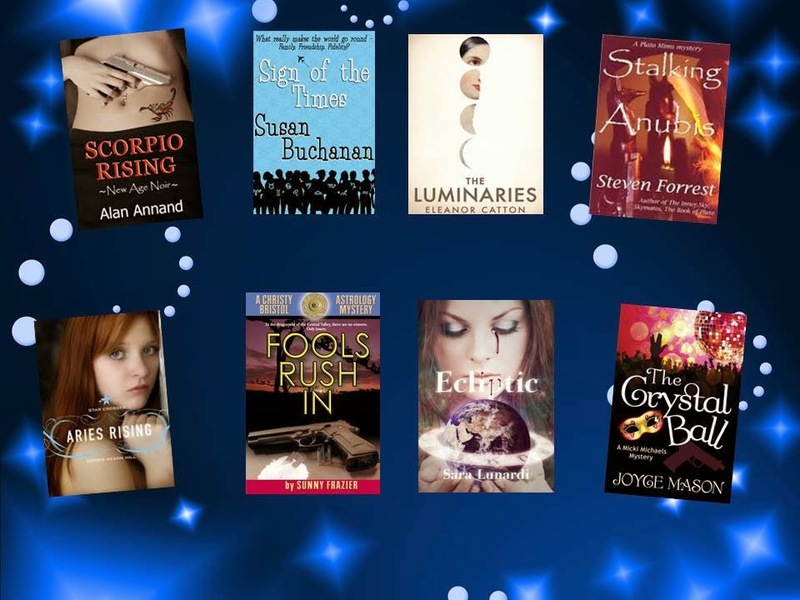 I thought it would be fun to share the titles, a bit about them, and to give my readers the joy of discovering fiction that appeals to your love of astrology. You know how Virgos love research. I knew there had to be others. Here’s what I dug up, so far. The author links have blurbs or author interviews with details about the books. Most can be purchased at the usual online stores, such as Amazon or B&N. No surprise with her Aries Moon, Astrologer Donna Cunningham wrote Hotline to Heaven over a decade ago, a book she offers as a free PDF through her Sky Writer blog site. Learn more and download a copy here. (See Introducing Donna’s Two Mysteries about mid-page.) Donna also sells the sequel, Angel in Peril, on the same page for $6. Please share in the Comments! I’d like to update the list periodically on The Radical Virgo. And if you’ve got a book review on any Astro-fiction title, contact me about possibly sharing it here.